*UPDATE* Fallout 4 is now out of stock. Climb into your power armour and head back into the Wasteland with Fallout 4. 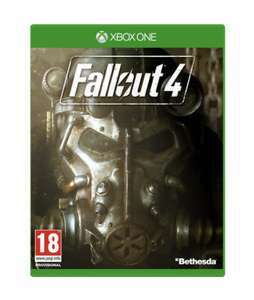 Fallout 4 is the latest instalment of the acclaimed Fallout series, and expands on the post-apocalyptic setting by sending you into the ruins of Boston - now known as the Commonwealth. With a huge open world environment and hundreds of locations, weapons and missions, Fallout 4 is certain to be one of the games of the year. Trace back to the founding moments of the Assassin’s Brotherhood and explore the intriguing land of ancient Egypt in Assassin’s Creed Origins. Uncover the mysteries of the first pyramids, sail down the Nile and take on a host of dangerous enemies while jumping into a number of gripping quests. From the pyramids and deserts of Giza to the Mediterranean Sea, Origins lets you explore a huge and unpredictable world. The combat system has been completely redesigned for this new game, so you have more control over every fight. And with new weapons that each have different levels of rarity and strength, you can completely transform your playstyle depending on what you find and arm yourself with. When was it £4.99? I paid £20 months ago. Are you thinking of Fallout 76? I paid £7 for it 18 months ago. I felt I overpaid and sold shortly after. Are you thinking of Fallout 76?I paid £7 for it 18 months ago. I felt I …Are you thinking of Fallout 76?I paid £7 for it 18 months ago. I felt I overpaid and sold shortly after.